A diverse range of businesses is involved; most are relocating in the northern and eastern sectors of Mexico City. The migration has boosted the number of available jobs in Mexico City and also led to an increase in foreign investment. We introduced the on-going renovation project to beautify Mexico City’s Historic Center in The revitalization of Mexico City’s historic downtown core. The Trust Fund set up to rejuvenate Mexico City’s Historic Center repaired and cleaned more than 1000 facades between 2007 and 2010, with a total street frontage of 11.24 km. The work is part of the renovation of Mexico City’s Historic Center which now looks better than ever! Work continues on many other buildings that still require attention. 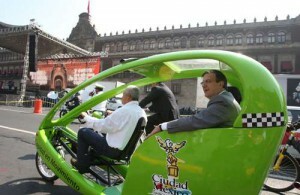 Cycle taxis or pedicabs (bicitaxis) have become a much more common sight in downtown Mexico City. Less than three years after their introduction, they are now carrying about 180,000 passengers a year, according to an official of Mexico City’s Historic Center Trust Fund. The vehicles were introduced as part of the Trust Fund’s efforts to revitalize the historic downtown core of Mexico City. They help to reduce the city’s CO2 emissions. There are currently 132 licensed cycle taxis operating in the downtown area. They combine pedal power with small electric motors. Their “drivers” double as informal tour guides. Each cycle taxi is about 3 m (10 ft) long.